Decorative edges are cast brass, and that means solid brass. The plating won't fall off in a few years and leave behind a mess of rust, because there is no plating on these. Some makers in the late 1800s used these to protect the edges of their trunks, but over time this style of edge became more decorative than anything else. Nail them in place and then watch your shins, brother, because you don't want to smash it into one of these brass edges in the middle of the night. Three-legged decorative edges, or four-legged decorative edges. You decide. Prices include shipping to any USA location. SOLD OUT of the 4-legged clamps - please check back! 3-legged decorative brass edge: $8.00 each These are 3-11/16" long and the legs reach out 1-1/4"
4-legged decorative brass edge: $10.00 each These are 5-1/16" long and legs reach out 1-1/4"
Solid cast brass slat clamps can also be used on any corner anywhere on your trunk. Very decorative, and very sturdy. Squares you see in the pictures are 1 inch by 1 inch, to help you gauge the size of this clamp. Basically it's 1.5" wide and 2.25" along each leg. Nice addition to any trunk or case. Pretty heavy - each one weighs 2.2 ounces. This is CRNR-26, made of solid cast brass just like the brass items posted above. This is a small one, meant to protect the edge/corner of your trunk. This little clamp can on any edge anywhere on your trunk. Very decorative, and very sturdy. Basically it's 1-1/8" wide and 2-5/8" along each side, with a 90 degree angle amidships. Again, this is pretty heavy, like the other brass items above. Slat clamps are the metal pieces that cover the ends of the wooden slats on the outside of your trunk. You knew that already, probably. What you may not have known is that we carry authentic reproductions of original slat clamp styles, and we have two varieties. Both styles were commonly used; one is just a bit fancier than the other. Each style comes in four shapes - one is for the end of a slat, plain and simple, the second is for use on a "T-intersection" of two slats, common on the lids of many older styles. The third is called a 'flat clamp' and can be used on almost any type of slat intersection. The fourth style is larger - called a top-side clamp, and is used when you need a clamp that both covers the end of a slat and bends down over the edge of the trunk. Slat end clamps go over the end of a slat anywhere on your trunk. Plain steel, paint them or let them age (rust) naturally. These have a nice 'step-down' over the edge of the slat, as shown. Useful for slats up to 2.25" wide, probably shouldn't try to use them on slats that are less than 2" wide. Priced at $2.50 each, USA shipping included. Use these where two slats meet. Stamped from plain steel, just like the originals. Paint them or let them develop that fine patina known as rust. Useful for slats from 2" up to 2.25" wide. Priced at $2.50 each, with USA shipping included. Use these anyplace two slats intersect - the 'ears' can be folded down over the edge of the slat for a nice finished look. These measure 3-3/8" by 2-1/2" overall. Distance between the nail holes is 2.5 inches. Made for slats that are 1.5 to 2 inches wide. These long clamps are used where a slat runs down to the edge of the trunk lid - they easily bend to fit over the edge of the trunk - then the 'ears' wrap over the edges of the slat. Overall length is 5.25", made for slats that are anywhere between 1.5 and 2 inches wide. Has a total of four nail holes ready for your nails. 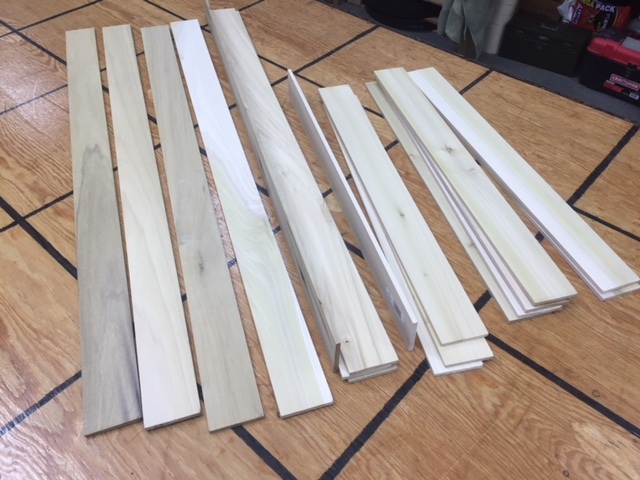 Our replacement trunk slats are milled from Maine poplar, and are all 2-1/2" wide and 1/4" thick. Shorter slats, 2.5" wide by 24" long each, are $10 each, 48-state USA shipping included. Long slats are 2.5" wide, 40 inches long, and are priced at $14 each, 48-state USA shipping included. These oak slats have grooves that are similar to those found on many styles of older trunks. Made from decent quality northern Maple. Each slat is 2 and 1/4" wide, 36" long, and 1/4" thick. We only offer them in this size. You can cut them shorter as needed. You can't cut them longer, and neither can we. Stain them to suit your tastes, then attach to your trunk. We recommend you pre-drill your nailholes to avoid splitting the slats.